Firewood is a great way to keep your home warm during the winter if you don’t have access to electricity – but you will need a good chainsaw for cutting firewood. There are countless of chainsaws on the market from many household brands – but not all were designed for cutting firewood! Some chainsaws are designed for light seasonal work while others are built for heavy commercial cutting! Trying to cut a few logs of firewood with the wrong kind of chainsaw is not a problem (just watch out for the kick on commercial models) but if all you need to cut every season is a few ranks or cords of firewood you should have the best tool for the job! 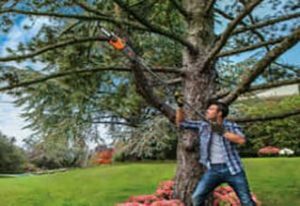 Choosing the right chainsaw can be tough – especially if you are unfamiliar with lawn and garden tools. To make the process of finding the right model easy for you we researched all the top models and read hundreds of owner reviews to find out who was the best. In our guide we put together a quick comparison table so you can compare models side by side. Then, we put together a detailed review of our x favorite chainsaws. Don’t forget about our Buyer’s Guide and FAQ section incase you have any questions! Our team put together a comparison chart of our 4 favorite chainsaws for cutting firewood – plus an in depth review so you can find the right model. The buying guide has helpful tips and tricks, plus advice on additional gear and safety to get you started! Need a chainsaw that can cut multiple cords of firewood and get you back inside before you feel the winter freeze? 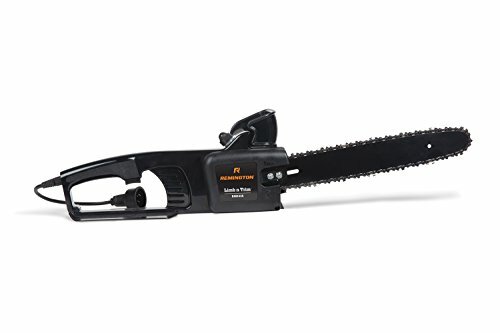 This BLACK+DECKER chainsaw was designed for people who cut their own firewood – every year! The bar is 10″ making is perfect for cutting logs and other small wood into fireplace sized pieces. 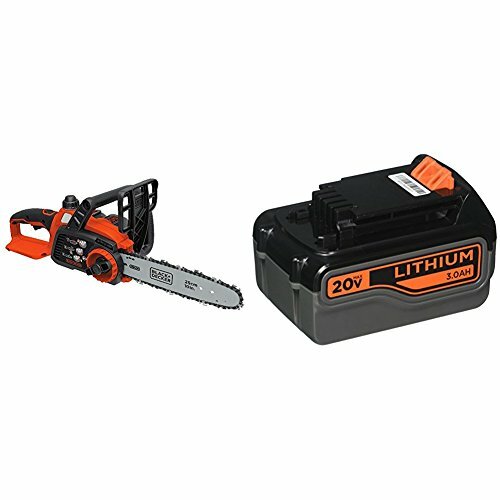 The chainsaw is powered by a 20 Volt, Max lithium battery and has more than enough run time to finish the chores without recharging or changing batteries. 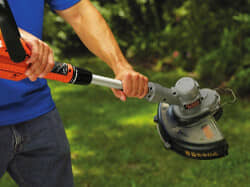 The battery is one of our favorite features since it makes everything much lighter than gas powered models so you can make more cuts without feeling it in your arms! Need to cut a few cords of firewood deep in the woods – away from a power outlet. 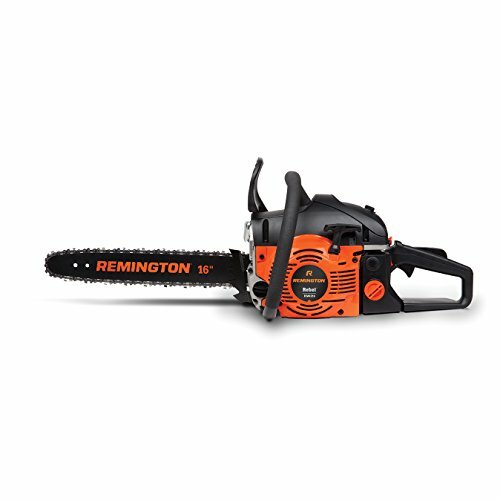 Sometimes gas powered chainsaws are the only choice – when that is the case we recommend the Remington RM4216 Rebel. One of the first things we test when reviewing a new chainsaw is the starting system. The RM4216 has one of the most dependable starters with an easy to use On and Off button plus push bulb primer. This chainsaw is designed for cutting logs, branches and tree limbs up to 12 inches in diameter – any larger and we recommend making multiple cuts. Remember, this model is gas powered so you will need ear plugs to go along with your normal safety gear like glasses and gloves! 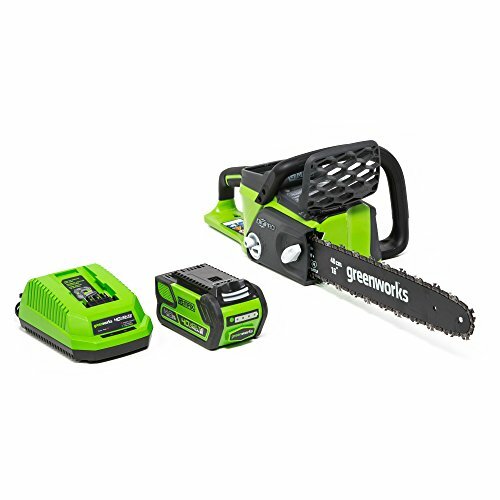 This saw from Greenworks is when you have easy access to a power outlet. While the battery last for many hours (and hundreds of cuts) it will still need charging from time to time. Weighting just over 10 pounds makes it super easy to use. In addition, the motor and handle were designed to reduce vibration and kickback by over 70%. 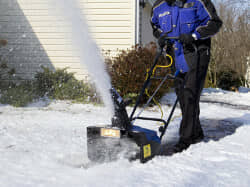 The chainsaw is powered by a brushless motor – giving the user extra battery power and more torque. Another plus is the noise. Since it is powered by an electric motor you can use it on a Sunday morning without waking the neighbors. 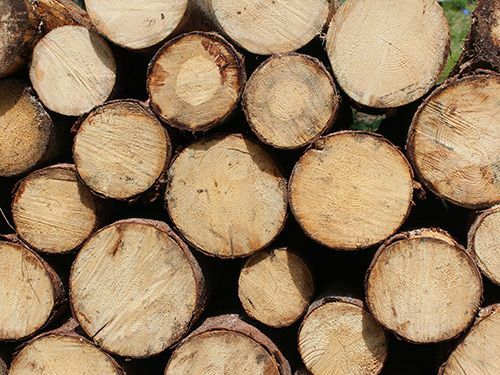 User reports and field test show no problem cutting through logs as thick as 18″ to 24″, even at high elevations where it can be difficult to start more powerful gas chainsaws. One thing to keep an eye on is the bar chain oil – there are reports of it leaking, especially if it is stored in the onboard reservoir. If you only need to cut firewood to burn for a few days and don’t want to spend a ton of money this Remington model is a great budget option. Why is it cheaper? A smaller battery, less power and occasional maintenance problems – but don’t let that scare you! The chainsaw does a great job at cutting branches, limbs and smaller trees into firewood but does have problems with thicker logs as well as the engine stalling after getting clogged with wood chips. There are also reports of the chain falling off after heavy use – it can be reattached with some elbow grease or a quick trip to the hardware store but it will slow you down. This problem can be avoided by properly attaching the tension screws to the chain so it lays flat on the bar. If not, it will lack power and fall off every few cuts. Not sure where to start? If you are unfamiliar with shopping for lawn and garden equipment we will walk you through what is most important! A good chainsaw is essential for get the job done quickly. Sure, you could chop firewood with an axe, hatchet or saw but who wants to spend all winter working outside in the cold? A chainsaw can make hundreds of cuts per hour – letting you cut your cords in a fraction of the time. Before you start filling the gas tank (if you haven’t switched to electric) don’t forget to mix your gas and oil – or use pre-blended fuel. The most common reason for a chainsaw not starting is an incorrect fuel mixture! If you are not sure what kind of fuel you need check your owners manual or the manufacturers website. Chainsaw can be dangerous if used incorrectly or without safety gear. Wood chips, shavings and kickback from the bar can serious injuries that will require a trip to the hospital. Always wear safety glasses, gloves, closed toe shoes (preferably steel toe boots) and pants!